Michael Gilman, current president of the International Society of T’ai Chi Ch’uan Instructors, is a longtime teacher in the human potential movement. He was born in San Francisco in 1943. After graduating from the University of Arizona with a degree in Theater Arts, he worked as a television director, actor, and dancer. 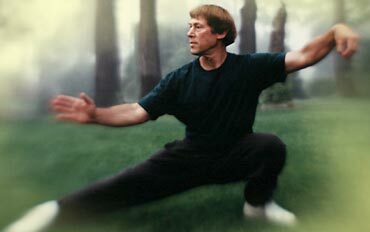 Gilman began his studies of Tai Chi Chuan in 1968 with Master Choy Kam-man in San Francisco. Master Choy’s father Choy Hok-peng, a longtime student of Yang Cheng Fu, is credited with introducing Tai Chi to America in the 1940s. Master Choy taught the full Yang Style curriculum and that is the system that Michael still practices and teaches. Michael was authorized to teach by Master Choy in 1973 and moved to Tucson, Arizona to begin teaching. Over the next eight years Michael worked with over fifteen hundred people, including such diverse groups as the Tucson Ballet Co., Tucson Opera, Tucson Museum of Art, University of Arizona, Tucson Public Schools, YMCA, as well as running a successful Tai Chi Studio. During this period he also taught in Florida, Oregon, California, and New Zealand. In 1981, Michael moved to Port Townsend, Washington and opened the Gilman Studio where he continues to lead classes and workshops. Besides his long-term association with Master Choy, Michael has studied with Jou Tsung Hwa, Dr. Yang Jwing-Ming, T.Y. Peng, T.T. Liang, George Xu, William Chen, Liang Shou-Yu, Tao Ping-Siang, Fu Shen Yuan, Wang Bao Ren, Gao Fu, Ken Cohen, and Sam Masich. Michael organized the Northwest Tai Chi Chuan Push Hands Championships, and is himself a tournament Grand Champion. In 1994, Michael won the title of Grand Champion at the prestigious “Taste of China” All Tai Chi Tournament in Virginia. In 1995, he was honored by being chosen as an Advanced Form Judge of Internal Arts at the International Kung Fu Championships in Seattle. He was a forms and Push Hands judge at the Dallas International Championships in 2000. In 2004 and 2005, Michael was referee for Push Hands at the Pacific Elite Tournament in Vancouver, B.C. as well as a seminar presenter. He is also a certified judge for Push Hands tournaments worldwide. Michael also qualifies as an expert witness for Tai Chi and Chi Kung in the legal system. He can be contacted for his services in these areas. In addition to directing the Gilman Studio of Tai Chi Chuan, Michael is the author of two popular books on Tai Chi Chuan, and has published numerous articles, and produces a long running Tai Chi and Chi Kung series for public television. He also coordinated the annual Labor Day Energetic Retreat in the Olympic National Park attended by people from all over the U.S. and offers free classes worldwide via his web site –www.gilmanstudio.com.Michael’s most recent book is 101 Reflections of Tai Chi Chuan and his first book entitled A String Of Pearls, is now in its second edition (the title was changed to 108 Insights into Tai Chi Chuan) and is available in French and Italian translations. Both books have proven to be very popular for all people interested in the Internal Arts and Self-improvement. He has also published many articles in Tai Chi Magazine, produced various videos (see our online store), and written The Tai Chi Manual, a study guide for students and teachers of the Yang Style of Tai Chi. Michael has also been much honored for his continued dedication to helping teenagers. Michael’s eclectic interests, studies, and teaching include Advita Yoga with Master Subramuniya (Michael was Master Subramuniya’s personal chef), Hatha Yoga with Swami Vishnudevananda (Michael taught Hatha Yoga at the Vishnudevananda Ashram), Zen Buddhism, Arica (Michael taught Arica in Tucson), Trager Psychophysical Integration (Micheal taught for the Trager Institute), and Dependable Strengths ((Michael taught for the Dependable Strengths Institute). One of Michael’s latest outlets for his creative energy in the field of health and wellness education is the International Center for theHealing Arts, which he originally founded in 1982. He is busy rejuvenating his idea of training people in careers that bring improvement to the world situation as well as career satisfaction. Recognizing the need for qualified Tai Chi and Chi Kung instructors, Michael is currently very active in teachers trainings for these arts, designing onsite and distance learning certification programs. Michael has studied with and was mentored by such notables as Master Subramumiya in Advita yoga, Swami Vishnudevanda in Hatha Yoga, Milton Trager M.D. in Psychophysical Integration, and Bernard Haldane, PhD in Dependable Strengths Process. This unique combination, combined with decades of Tai Chi study and training, led to the development of the Ting Fa Theraputic Approach and the Opening the Gates Chi Kung. Opening the Gates is the result of Michael’s determination to explore the depths of the human experience. It is a combination of Tai Chi, Yoga, traditional exercise, Chinese natural medicine, psychology, and body therapy. It is a complete system for attaining and retaining optimum health. There is a two part, two hour video, instructing this effective system. It is available at the store or on YouTube. Michael’s latest development in the energy field is call ChiCycling. It is a combination of Chinese Natural medicine, Tai Chi, Qigong and western exercise. It is easy and fun to learn and practice, and results are assured. The instructional video is available at the store or on YouTube.